Pictures and video footage of the initial level school (nursery/preschool) that Mi Casa de Angeles completed in partnership with its Peruvian NGO partner, Sembrando Juntos. The school opened on March 15, 2015, and the following week, Founder Gabriella Brignardello and COO Melissa Levinsohn visited Peru for the school's inauguration ceremony on March 24, 2015. It was a very exciting day for both the Mi Casa de Angeles and Sembrando Juntos teams as they celebrated two years of hardwork with the community of Pachacutec, Lima, Peru. The school currently has 4 classrooms for ages 3, 4, and 5 and approximately 100 students - and enrollment continues to increase every week as more families visit. Since its opening in March, 2015, the school has developed a nursery program for ages 0 to 3 and has constructed a community library and playground. What have we done so far? Why join us in our mission? A summary video outlining what Mi Casa de Angeles has done since its inception in November 2009: total of raised funds, the sponsorship of a teacher in an existing public school through Ensena Peru, and the groundbreaking of an initial level school (ages 0 to 5) in Pachacutec that is in partnership with Sembrando Juntos. A brief documentary about Pachacutec - a shantytown located in the outskirts of Lima, Peru. Together with Sembrando Juntos, a Peruvian non-profit organization, Mi Casa de Angeles is working to construct a community center and initial school (nursery/daycare and preschool) that will directly benefit 3,600 families by providing the children, ages 0 to 5, with the best foundation for higher quality of education. The documentary includes: interviews with the town leader, the mother of one of the families whose children will benefit from the program, and the founders of Sembrando Juntos and Mi Casa de Angeles; footage that depicts the daily life of a Pachacutec community-member; and footage from the groundbreaking ceremony that took place in March 2013. Pictures and video footage from the Groundbreaking Ceremony on March 22, 2013 for the “flagship” school. Three non-profit organizations, Mi Casa de Angeles, Sembrando Juntos, and Lincos, are working together to build a nursery/preschool in Pachacutec, Lima, Peru that will provide the children, ages 0 to 5, in this community with a higher quality of education. Thank you to all who have helped us get to where we are today – breaking ground of our first school, improving the quality of education, and empowering the underprivileged children in Peru. Mi Casa de Angeles implemented its first project in Peru in 2012 by sponsoring a 'joven líder' or ‘young leader’ through Enseña Perú (Teach Peru). These highly trained and qualified teachers have been proven to positively impact about 100 students in Peru's public school system which serves the impoverished population who cannot afford private education. Enseña Perú, a nonprofit organization in Peru, is dedicated to giving all Peruvian children and young people, most especially the impoverished, the opportunity of an excellent education while also building a global movement of young Peruvian leaders who will contribute efficiently to eliminating the inequality and low quality of education in the public system in Peru. Gabriella Brignardello, then a senior at La Reina high school, is the founder of Mi Casa de Angeles, which she established in 2009 for the purpose of raising funds and awareness to provide a higher quality of education and to empower children throughout the impoverished areas of Peru. The inspiration for creating this non=profit organization came to Gabriella at a very early age while visiting Peru and witnessing the hardships that many destitute children face on a daily basis. She immediately realized that she wanted to make a change in these children's lives. In this short video, Gabriella gives an inspirational presentation to an audience of over 300 people at the TEDx Conejo conference. Gabriella Brignardello, Founder of Mi Casa de Angeles, presents to a large group of junior and senior high school students at the Rotary's RYLA Conference in Ojai, CA. Talking about her passion, mission, and goals, she strives to inspire the students to take action and set personal goals for the cause that is most important to them, while also sharing with them about the adverse issues and circumstances that impoverished children face while attending public schools in Peru and Mi Casa de Angeles’ mission to improve the quality of education for these children. Gabriella Brignardello, Founder of Mi Casa de Angeles, is one of the keynote speakers and presents to an audience of 400 at the Rotary International’s Symposium to Eliminate Poverty Sustainably (STEPS 2012), which took place at the University of California, Santa Barbara (UCSB). A compilation of the Mi Casa de Angeles presentations made by Gabriella Brignardello in 2012. These presentations include Rotary International’s STEPS (Symposium to Eliminate Poverty Sustainably) Conference, TEDxConejo, RYLA, and the Mi Casa de Angeles 2nd Annual Benefit Fashion Show. Founder, Gabriella Brignardello interviews with the "Be Remarkable" channel, which is organized by SadovnickPartners, and shares about her connection to Peru, the beginning Mi Casa de Angeles, and her views about leaders making a difference. 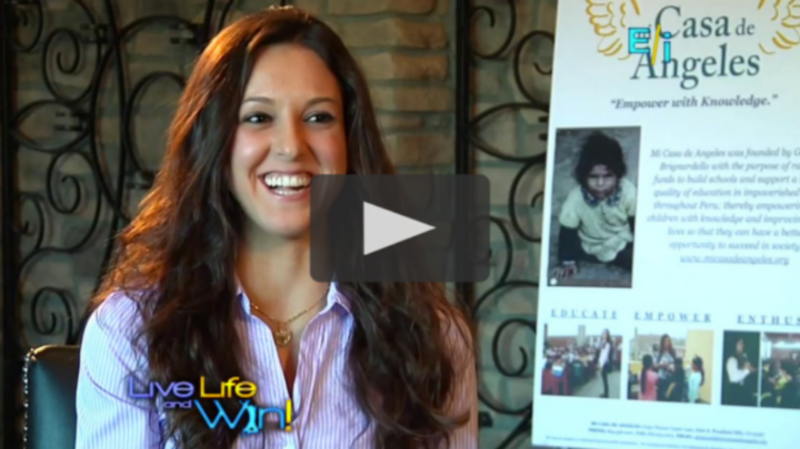 Gabriella Brignardello, Founder of Mi Casa de Angeles, was interviewed and featured on the television series "Live Life and Win!" in November, 2013. Gabriella Brignardello, Founder of Mi Casa de Angeles, receives the National Association of Women Business Owners (NAWBO) Young Woman Entrepreneur of the Year Bravo Award on Friday, October 19, 2012. Picture and video footage from our Night of Ping Pong at SPiN at the Standard in Downtown Los Angeles. It was an evening filled with lots of ping pong playing as well as a special exhibition by Carlo Brignardello, Former National Table Tennis Champion of Peru, and a special appearance by Soo Yeon Lee, an international table tennis champion, fashion model, and actress. Through ticket sales, donations, the silent auction, and the raffle, Mi Casa de Angeles raised over $22,500. After running two half marathons in October and December 2013, Gabriella Brignardello, Founder, ran in the LA Marathon on March 9, 2014 on behalf of Mi Casa de Angeles. She completed all 26.2 miles in 3 hours and 51 minutes, representing her cause every step of the way. Through sponsorships and donations, she raised $7,500. 4 boutiques. 2 restaurants. wine & beer bar. 4 hours of shopping. 1 dance performance. 31 stunning models. 1 runway show. Pictures and video footage from the Mi Casa de Angeles 3rd Annual Garage Sale that was held on Saturday, March 17, 2012 in Thousand Oaks, CA. Thank you to all of our volunteers, donors, and supporters who helped made this event possible and a great success! This fundraiser generated about $9,000 – an amount that will make a significant impact on our efforts to improve education for the impoverished children in Peru. Pictures and video footage from the Mi Casa de Angeles fundraising events in 2010 and 2011 which included the 1st Annual Garage Sale, a Movie Night, the 2nd Annual Garage Sale, and the 1st Annual Benefit Fashion Show. The total amount raised was over $32,000! Thank you to all of our volunteers who helped make all of the Mi Casa de Angeles fundraisers successful in 2010 and 2011!